Tip: What Stops People from Volunteering? Welcome to 2016. Just as individuals make new year's resolutions, organizations tend to assess their priorities when a new year begins. So this is an excellent time to open discussion on strategic planning for volunteer involvement. What are your organization's goals for what volunteers will accomplish this year? The consequences of unclear goals are far-reaching! Read this month's Hot Topic. NEW BOOK COMING IN FEBRUARY! 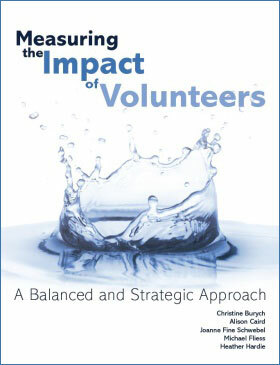 Energize, Inc. is delighted to pre-announce the publication of Measuring the Impact of Volunteers: A Balanced and Strategic Approach written by a Canadian team of experienced leaders in volunteer management: Christine Burych, Alison Caird, Joanne Fine Schwebel, Michael Fliess, and Heather Hardie. The latest buzzword in volunteer management is "measurement" - and we need better measurement tools to demonstrate the impact of volunteers, not just to count their heads! The authors provide ideas and tools to implement a balanced and strategic approach to measuring, promoting, and supporting the success of volunteer engagement in your organization. Their approach emphasizes that the assessment of and planning for volunteer engagement should align with the priorities of the organization and its clients' needs. For those familiar with the "balanced scorecard" measurement tool first developed by Kaplan and Norton in the 1990s, the book adapts those concepts, creating a unique Volunteer Resources Balanced Scorecard (VRBSc) to address the requirements of volunteer resources management. For those being introduced to the balanced scorecard method for the first time, the book provides a step-by-step overview of the process. Measuring the Impact of Volunteers will be available in a few weeks. If you wish to be notified when it is ready for purchase, click the button below to sign up for a direct notice. We added two great books from the UK to our store at the end of 2015. If you missed that announcement last month, here they are again. The UK publisher, Directory of Social Change, has recently discounted these PDF e-books and we're passing the savings on to you! A unique, if not the only, guide about recruiting and involving high-profile personalities as patrons, presidents or other volunteer roles in nonprofit and charitable organizations. Debra Allcock Tyler, chief executive of the Directory of Social Change in the UK, tackles "what they don't tell you" about leadership at the senior level, blending theory, practical advice, and humor. Have you visited the free Virtual Volunteering Wiki lately? Jayne Cravens and Susan J. Ellis have continued to keep it current, posting articles and resource information on the subject of online volunteers. It serves as a "living appendix" for their book, The Last Virtual Volunteering Guidebook, and provides a lot of cutting-edge information for volunteering in cyberspace. If you're on LinkedIn, you can also join their Virtual Volunteering Group there to discuss the topic with colleagues doing innovative work. Professional Development opportunities - conferences, courses, webinars, and more. PLEASE SUBMIT EVENTS FOR POSTING HERE! 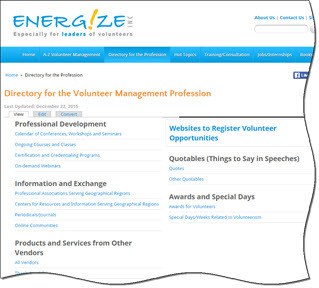 Professional Associations for managers of volunteer resources locally, nationally, and internationally. Submit associations or centers for information here. Products and Services produced for our field by a variety of vendors. Jobs and Internships in volunteer management. Submit jobs or internships here. Our site is only as strong as the postings YOU submit, so please remember that there are forms on every page on the site to help you spread the word about things you want colleagues to know about. Volume XVI, Issue 1 of e-Volunteerism, our international, subscription-based journal for informing and challenging leaders of volunteers, is now complete and will be succeeded by the next issue on January 15, 2016. As always, all past articles will be available to subscribers online in the Archives. Succession Planning (V, 2, January 2005) - Adaire Palmer reminds us that succession planning has implications for an entire organization. It is part of capability training and performance monitoring, and also connected to career development planning for individuals, leading to future sustainability of an organization. Where the Boys (and Girls) Are: Volunteers at Little League International - Lori Renner Larsson explores the history of Little League and what youth sports can teach any volunteer-involving organization about recruiting male (and female) volunteers and the importance of a national office responsible for volunteer engagement. What Can Organizations Do to Alleviate Volunteer Stress? - Laurie Mook reviews a research study looking at the organization's role in volunteer stress and burnout, with insights into how to ameliorate and manage them. How to Embrace Volunteering Trends and "Newer" Volunteers - Erick C. Lear takes us Along the Web to find resources that describe the characteristics of evolving categories of potential volunteers, with a focus on their motivations, preferences, and needs. A new issue of e-Volunteerism will launch on January 15, 2016. Among the interesting and useful content will be: a Points of View essay posing the question, "Could Robots Do the Job of Volunteer Managers? "; a feature article on understanding the "psychology of giving and receiving advice" and its connection to volunteer leadership; a review of a study on volunteer/employee relationships; ideas for starting a volunteer management "book club"; Web resources on volunteering with and for refugees; and more! As a recruiter, it is important to understand what motivates people to volunteer. You can then address those desires in your recruitment campaign. But it is equally important to consider what might stop someone from accepting your invitation to give time and skills. By identifying the obstacles to volunteer recruitment, you can either change the negative factors into positive ones or you can acknowledge concerns before the prospective volunteer raises them. There is no public transportation close to your facility, or the parking situation there is bad. You need volunteer help at specific times, and some people are not available then. The work is repetitive, dull, or physically difficult - or simply does not appeal to the prospect's personal interests. The problems you are addressing seem overwhelming. A negative image about your agency's work in the past. Incompatibility with the personalities of long-time volunteers already working there. Thinking all of your volunteers now are older, or women, or members of some group unlike the prospective volunteer's group. Being afraid they will see something distasteful or frightening. Fear of failure or that the work will be more difficult than they can perform. If you can identify such concerns, you may need to stop recruiting and spend time improving the options for how volunteers can give their time. Otherwise you will continue to encounter obstacles in convincing people to sign up despite their concerns. For example: Do you have the flexibility to accommodate a greater diversity of time schedules? Can you assign volunteers in teams so as to minimize possible fears about personal safety? Can you reimburse out-of-pocket costs? Will you provide training? By identifying the obstacles and addressing them, you can turn resistance around. They may already be committed to the maximum level with other community or family responsibilities. They may simply not be interested in the specific role you offered to them or in the client group you serve. The timing of your request may be inconvenient: A child or parent may be sick, the bar exam may be looming in a month, or they may have just accepted a new job with more time-consuming responsibilities. On the other hand, the phrase "Sorry, I'm too busy" may be code for "What you just asked me to do has too little interest for me to make time in my life for it." As a recruiter, you need to be sure which factor is at work. Try a follow-up question, such as: "Would you prefer me to call back in a month?" or "Is there another type of volunteer assignment that you would prefer to do?" Another approach might be: "If you had the time, would this volunteer assignment interest you?" If the answer is yes, you might negotiate a return call in the future. If the answer is no, you can follow up with other ways the person can volunteer with your organization. Are you a leader of volunteers in a healthcare setting and work in one of these southeastern states? Your help in needed to complete a brief online survey for a new research study of volunteer management leadership styles. Again, you must work in healthcare, in the southeastern U.S., and in a hospital that is surveyed by Medicare (no children's, pediatric, or VA hospitals). Please participate and grow our knowledge of the field. For more details and to indicate your willingness to take part, e-mail Patricia Wright at PatriciaWrightdba@gmail.com by JANUARY 15, 2016.